Hezbollah, as both of political and combative organization, is far from a one-dimensional terrorist group. Since the Islamic Revolution in 1979, Iran has worked to spread the fires of revolution within the Arab world as a mechanism for removing Western influence from the region. The manifestation of this Iranian influence can be found within Hezbollah and its ascendence within Lebanon over the last 30 years. The leadership structure within Hezbollah is opaque without a clear understanding of the involvement, motivation, and goals of Iranian influence. Although Hezbollah projects an autonomous political persona, there is minimal separation between their politics and the directives of the Supreme Leader in Iran. That being said, Hezbollah plays an important part in Lebanese politics in that they hold roughly ten percent of the available seats in Parliament as of most recent elections. Hezbollah is organized to have four organizational levels, the top levels being the most visible to the public while the last levels are the mujihidin, or their guerrilla fighters. 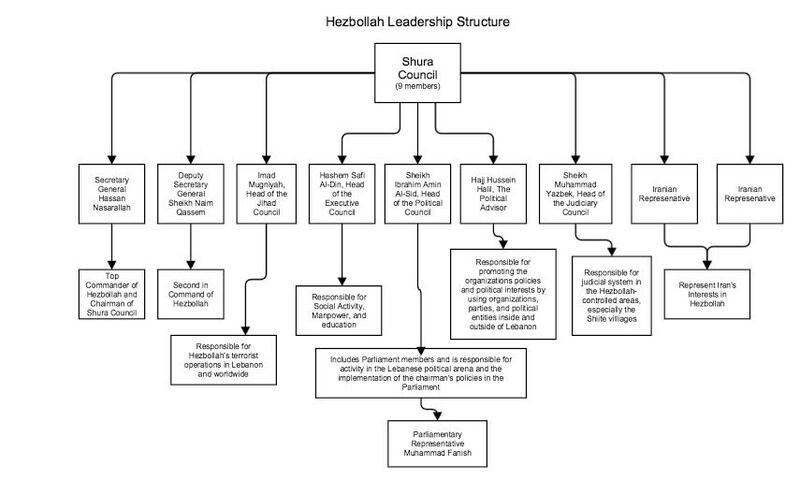 The Shura Council controls the leadership of Hezbollah. The Shura Council controls Hezbollah’s military and sociopolitical arms. The Shura Council is made up of nine members, seven of whom are from Lebanon and the other two are Iranian. Elections for members of the Shura Council have recently been held every two to three years. The Iranian members of the council are on the council in order to protect Iran’s interests in Hezbollah. The Lebanese members of the Shura Council are: Hassan Nasrallah, Sheikh Naim Qassem, Imad Mugniyah, Hashem Safi Al-Din, Sheikh Ibrahim Amin Al-Sid, Hajj Hussein Halil, and Sheikh Muhammad Yazbek. 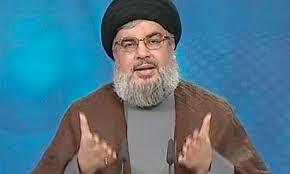 Hassan Hasrallah is the chairman of the Shura Council and the Secretary General of all of Hezbollah. He has led as Secretary General of Hezbollah since 1992. The Secretary General is the top commander of Hezbollah and serves for a term of three years with no limitation on the number of terms that he can serve. Sheikh Naim Qassem is the Deputy-Secretary General and the second in command of Hezbollah. The other five members of the Shura Council each head a sub-council, and each sub-council is in charge of several operational “desks” which are each responsible for specific topics. Imad Muhammad Yazbek is the head of the Jihad Council, also known as the military council in Hezbollah. The Jihad Council is responsible for Hezbollah’s terrorist operations in Lebanon and worldwide. Hashem Safi Al-Din heads the Executive Council, which is responsible for social activity, manpower, and education. It also has territorial responsibility and as a result is also connected to the organizations operational and terrorist activities. Sheikh Ibrahim Amin Al-Sid is the head of Hezbollah’s Political Council. This includes parliament members, and is responsible for activity in the Lebanese political arena and the implementation of the chairman’s policies in the parliament. Hajj Hussein Halil is the Political Advisor for Hezbollah. He is responsible fro promoting the organizations policies and political interests using organizations, parties, and political entities inside and outside of Lebanon. Finally, Sheikh Muhammad Yazbek is the head of the Judiciary Council. The Judiciary Council is responsible for the judicial system in the Hezbollah-controlled areas, especially the Shiite villages. Laub, Zachary. “Hezbollah.” Council on Foreign Relations. Ed. Jonathan Masters. Council on Foreign Relations, 3 Jan. 2014. Web. 11 July 2015. <http://www.cfr.org/lebanon/hezbollah-k-hizbollah- hizbullah/p9155>. Cohler, Sarah. “Hezbollah: Analysis of Violence.” American Diplomacy: Commentary and Analysis. American Diplomacy Publishers, Mar. 2011. Web. 11 July 2015. <http://www.unc.edu/depts/diplomat/item/ 2011/0104/comm/cohler_hezbollah.html>. Azani, Eitan, Dr. Col. (Res.). Hezbollah – A Global Terrorist Organization – Situational Report as of September 2006. Rep. Ed. Moshe Horrowitz. Herzliya, Israel: Institute for Counter-Terrorism, 2006. Investigative Project. Web. 11 July 2015. <http://www.investigativeproject.org/documents/testimony/260.pdf>. How is possible that Imad Mugniyah ( December 7, 1962 – February 12, 2008) is still a member of the Shura?